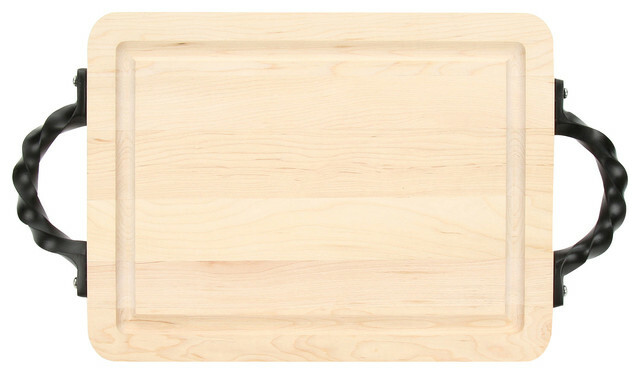 BigWood Boards Cutting Board, Twisted Square End Handles, Maple, 9"x12"x0.75"
From cutting to serving, this versatile cutting board is great for food preparation and makes a beautiful addition to your kitchen. Proudly made in the USA from wood that is responsibly sourced. Crafted of Maple, a wood that naturally resists bacteria growth and will withstand every day use for many years. Non-slip rubber feet keep the board in place and the perimeter groove catches juices which keeps the mess on the board and off the counter. Easy to care for using soap and warm water to clean and regular oiling to maintain. W 9" / D 12" / H 0.75" / 3 lb.